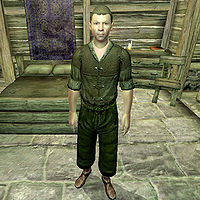 Istirus Brolus is a Breton rogue living with his wife Jantus in Bruma. Despite his adventurous youth, his daily routine is a very simple one. Istirus will start everyday at 6am by strolling around his house for the first three hours of the day, occasionally chatting with his wife Jantus. At 9am he will head outside where he will spend most of the day strolling around near the chapel and talking to the other townsfolk of Bruma. He will only take a brief break at 4pm, when he will instead head to Olav's Tap and Tack to have a two-hour meal. Once the sun has faded, Istirus will return to his house at 9pm to have his dinner during two hours in the company of his wife. After he has finished eating he will take one last walk around his house, until he finally goes to bed at 12am. The only exception to this schedule is during the Defense of Bruma, when he will cheer on Martin Septim as he makes his way out of the city gates to the battlefield. Istirus' garment consists of a full set of common lower-class clothing, including a burlap vest shirt combined with a pair of green felt linens and stitched leather shoes. He also carries with him the key to his house and a small amount of gold. He knows a set of rogue spells. His wife Jantus will offer more insight into the couple's past, and will inform the player that "Istirus and I used to be adventurers, but we've retired here. Bruma is far from civilization, but we're ready for a little peace and quiet." Although the subtitles read "Have a good day now" when exiting conversation with him, he will not actually say anything at all, nor will his lips move. Esta página foi modificada pela última vez à(s) 01h14min de 29 de dezembro de 2013.